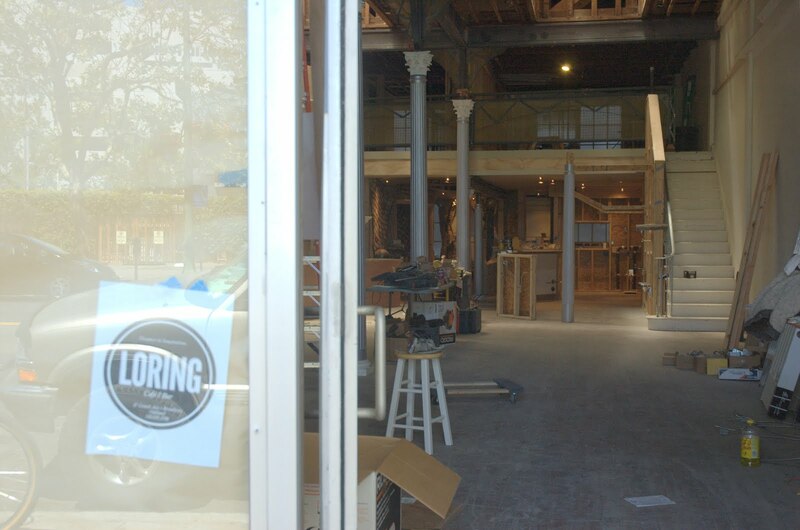 Tons of fun and interesting stuff going on in Oakland in the coming weeks. 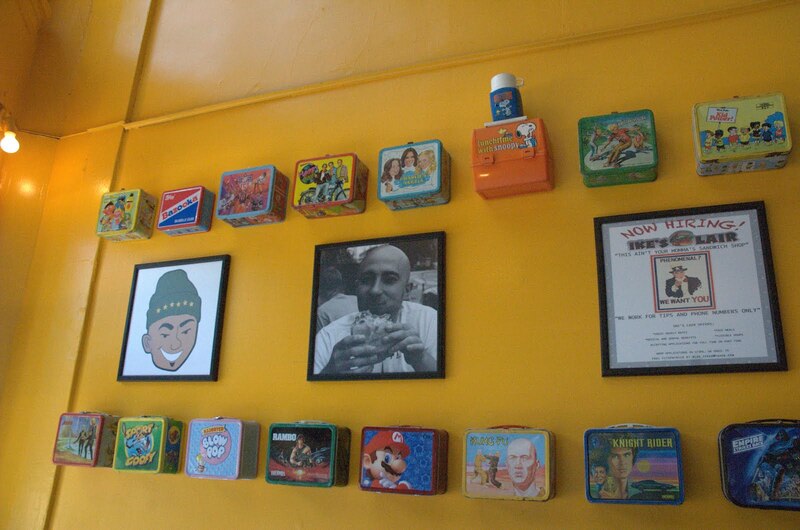 This weekend is the Oakland Pride Festival and on Monday is Hiero Day. 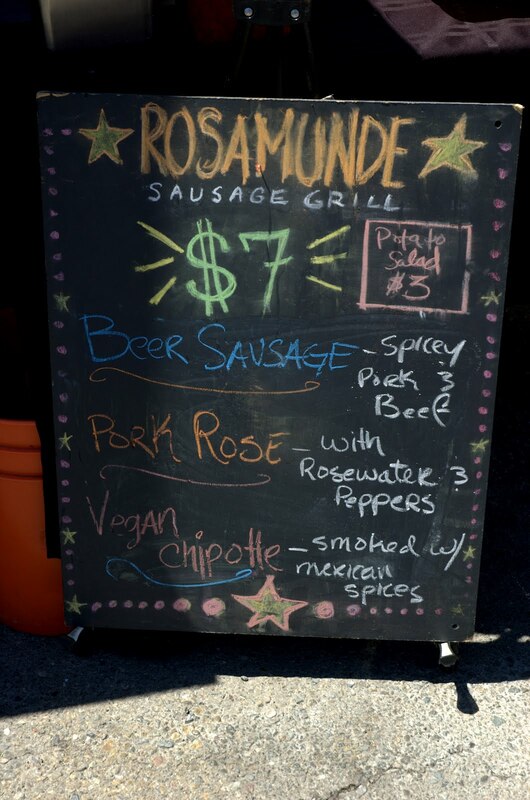 Oakland Pride - Sunday, September 2, 11am-7pm. 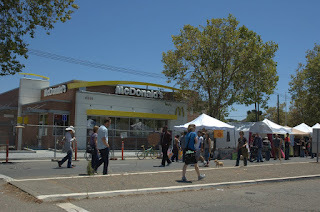 The annual Oakland LGBTQ festival in Uptown Oakland. 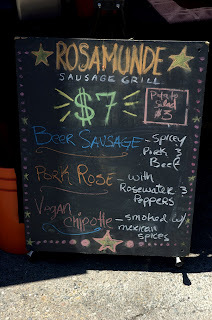 Read more at Oakland Local. Hiero Day - Monday, September 3, 11am-6pm. 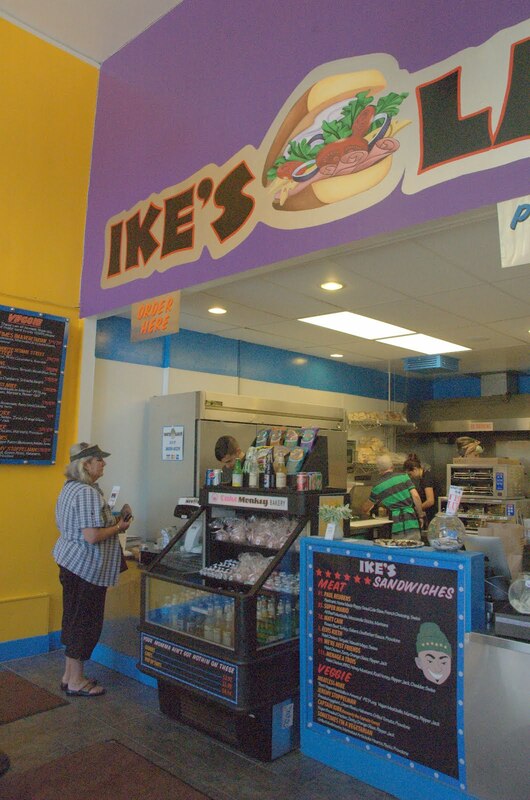 Hip hop and more on San Pablo Ave., featuring Kev Choice and others. 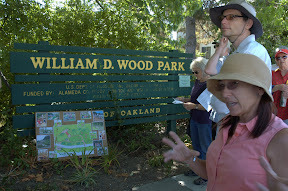 Saturday was the second to last Oakland Heritage Alliance walking of the 2012 season. 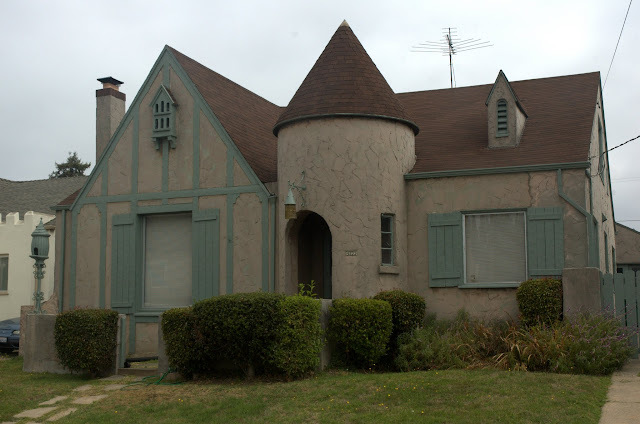 Picardy Drive: A Step Back in Time was led by nearby resident Andy Carpentier and focused on the unique storybook homes in what was once known as Normandy Gardens. We started by viewing houses on an adjacent street that were built just a few years earlier. 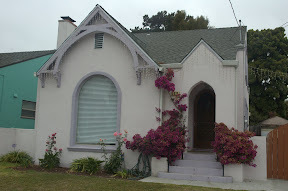 Most of these were typical California bungalows from 1924 or earlier, but a few houses had features hinting at what was to come, such as steeper, curved roofs. The houses in the area were mostly built on what had been a number of larger estates along Seminary near Mills College, including the F.F. Morse estate. One of the houses near Seminary has the remains of the original fountain from that estate. 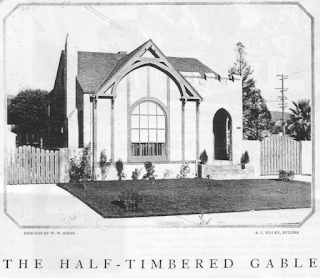 A few years later, builder Robert C. Hillen created his collection of "modest mansions" on Picardy Drive. He was an experienced builder who had put up dozens of Arts & Crafts bungalows in Alameda, but this was something different. Aficionados of the storybook style, which features quirky designs and features unique to every house may be wondering how a whole neighborhood of storybook houses was built. R.C. Hillen and architect W.W. Dixon did it by using a variety of floor plans (occasionally flipped) and by using a wide variety of details. Some of the houses have towers (either round or octagonal), others crenelated parapets; still others use variations of roof lines. While some feature arched windows, others have smaller, rectangular windows (and wooden beams) reminiscent of the Tudor style of architecture which influenced the storybook style. It all adds up to a quite a bit of variety amongst the 70 or so houses in the neighborhood. visually connect it to its neighbors, and all the homes were originally built with shake roofs and tinted stucco applied in a unique fashion. The result was a group of unique homes that were all connected. 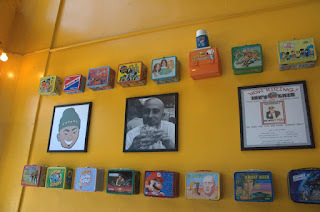 The legacy of that lives on today, as the neighborhood seems more connected than most. Each holiday season, the entire neighborhood displays Christmas lights for all to enjoy, and everyone seems to know everyone and keep an eye out for each other. 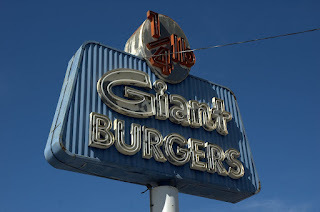 I've posted another 1/4lb Giant Burger sign (in the Dimond) and the 1/4lb Burger Xpress sign (in Golden Gate), but have neglected to post this great 1/4lb. 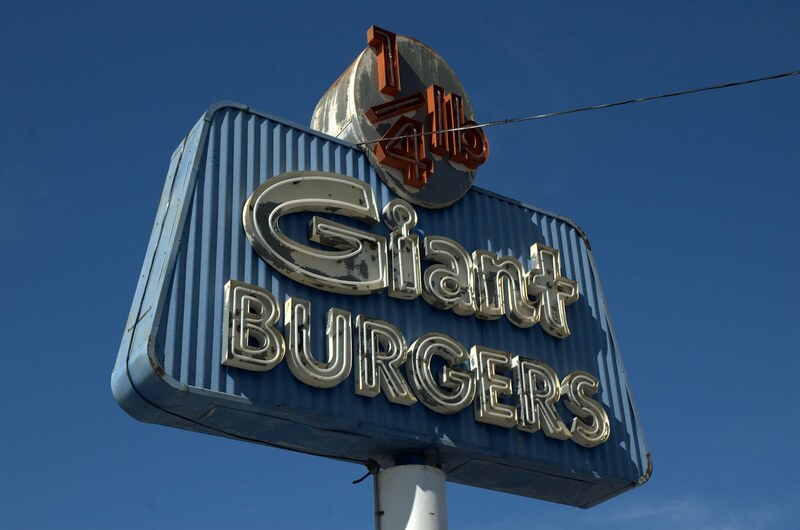 Giant Burgers sign in Uptown. It's not just a great sign, it's a great original building, too. Apparently they have vintage car shows there during First Fridays. Check out some pictures of the cars on Oakland Daily Photo. 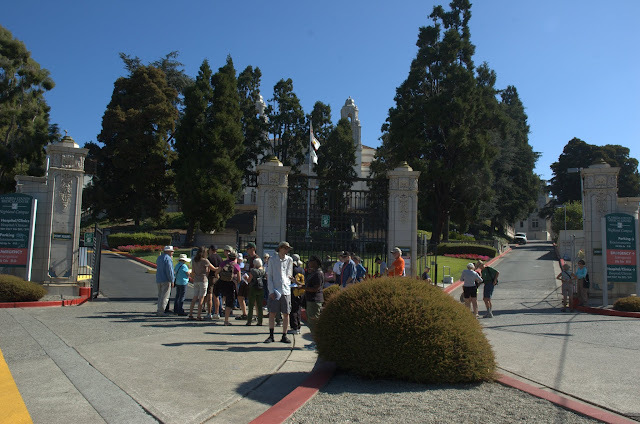 Saturday we had an amazing turnout for the Oakland Urban Paths walk focused on the stairs near Highland Hospital and the area around the EBMUD Central Reservoir. The day promised to be warm, but that didn't stop almost 60 people from showing up to walk. 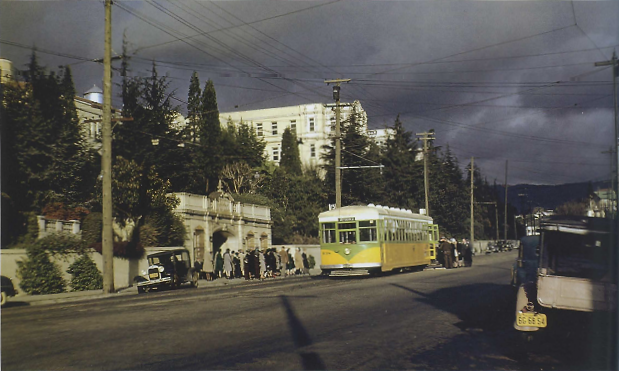 We started near the original front gate to Highland Hospital, where we admired one of the original 1920s buildings. It's reminiscent of a Mexican cathedral, in the Spanish baroque style of architecture. 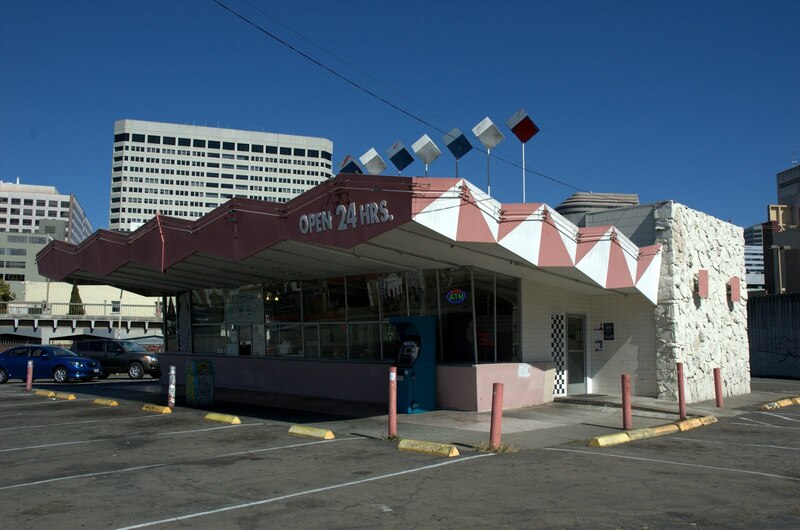 It was designed by architect Henry Meyers, who also designed the Posey Tube, the Veterans Memorial Building and other well-known structures in Oakland. 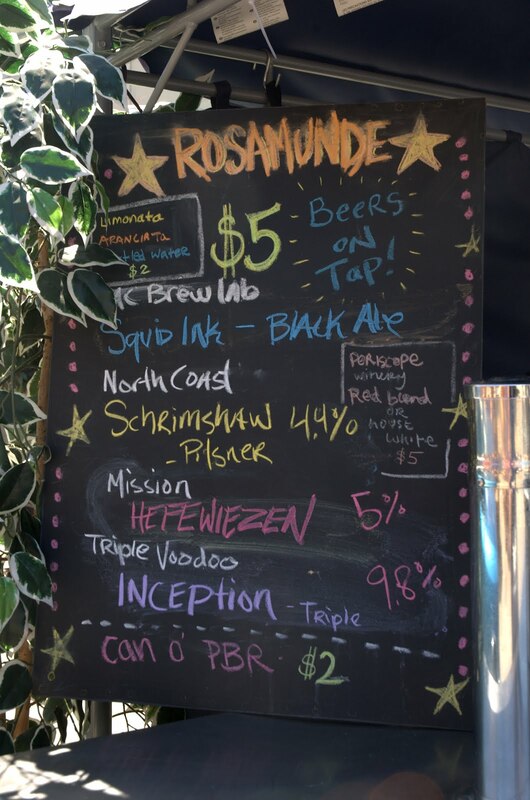 The grounds were designed by landscape architect Howard Gilkey, who designed the Cleveland Cascade near Lake Merritt, the Woodminster Cascade in Joaquin Miller Park, and other areas. The hospital came about because a citizens advisory commission developed a countywide plan for health care and facilities. 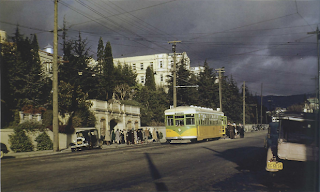 Then it was across 14th Avenue to explore various stairs that were built to connect residents of the nearby neighborhoods to the streetcars that ran on 14th Avenue. The stairs are unusual, in that some of the residences along them can only be accessed via the stairways. At top of one of the stairways, we admired the view and I told people about Dennis Evanosky's palm tree method. The palm trees we saw across the way were the ones marking the edge of the "Borax" Smith estate near Park Boulevard. I also told people about Andrew Alden's method of using sidewalk stamps for figuring out the age of a neighborhood. Neither Paul nor I knew the exact age of the stairways, but then I saw a stamp on one of them from 1922. Another of the stairways had been repaired fairly recently. Oakland Urban Paths cataloged all the stairways and pathways they could find in Oakland in 2009, and noted the condition and usage of each. The city then used that info for assigning priorities to which stairs got repairs. Paul then led us past numerous lovely Victorians and other homes, until we eventually came to the former home of John Cornelius McMullen which dates back to 1896. 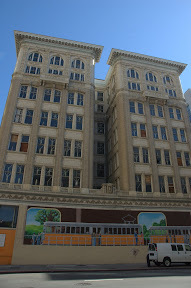 He was an attorney and banker who founded what became the State Savings Bank in Oakland. The brick building that was home to the bank still stands across from the Tribune Tower at 1305 Franklin Street; it’s called, appropriatley enough, the McMullen Building. John had served in the First Wisconsin Infantry during the Civil War and was with Sherman on his March to the Sea. He attained the rank of captain, but for some reason he was known as (and addressed as) "Colonel McMullen." 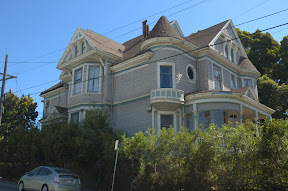 He died at his Queen Anne-style home at 2748 Grande Vista Avenue on December 30, 1912. He rests at Mountain View Cemetery. More walking gave us our first glimpse of the EBMUD Central Reservoir. It was built in 1910 by the People's Water Company. It covers 14 acres, and can hold 154 million gallons of water. Unfortunately, it leaked in the 1950s, and the resulting slide moved an entire neighborhood. The sliding was stopped by the Corps of Engineers, but it destroyed dozens of houses, and left the area unsafe to build. It became William D. Wood Park in 1976, and a now a group of dedicated neighbors are working to clean it up and improve it. We heard about the history of the park and the volunteer efforts from Jill Weil who lives nearby. There was a more recent slide west of the original, which destroyed additional homes. It's unclear whether the recent slide was the result of additional leaking, and a lawsuit was filed in 2007. We walked through Wood Park, then over to I-580, otherwise known as the MacArthur Freeway. A bridge took us over the freeway to the Altenheim senior housing in the Dimond. A short walk along MacArthur Boulevard and another bridge back across the freeway brought us to the other side of the reservoir. We meandered through several streets, back down the first set of stairs we'd climbed, and returned to the front of Highland Hospital. Another great walk. 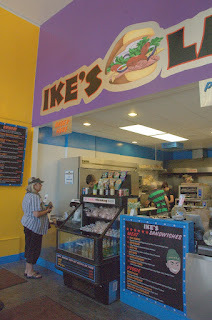 Thanks to Paul Rosenbloom for leading the tour, Jill Weil for telling us about Wood Park, Dennis Evanosky for information for the tour, and Annalee Allen for information about the tour and the mention in the newspaper. And thanks to everyone who showed up for the walk! If you've ever looked at a map of Oakland or traveled near the borders, you've probably realized it can be difficult to know exactly when you're in Oakland or in one of the neighboring cities. For example, while going south on San Pablo, you'll go from Berkeley, to Oakland, to Emeryville, back to Oakland. Here are some simple tips on figuring out where you are, as well as some basic information about the neighborhood. There are exceptions like the aforementioned older Oakland signs without the oak tree logo, or the special sign for "Bill Louie's Corner" in Chinatown that's blue and white, but in general it's a good way to figure out which city you're in. Once you know what city you're in, how do you figure out how old the area is? This technique I learned from Oakland geologist Andrew Alden, who led the Oakland Urban Paths: Rock and Walk in February. 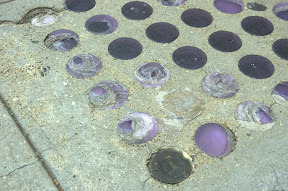 Look down at most sidewalks, and you'll see stamps in the concrete from the contractor who built them. This is far from an exact measure of a neighborhood's age, as sometimes sidewalks came first, sometimes they came later, and of course, sidewalks get torn up and replaced. But looking at a number of older stamps in an area can give you some idea of how old the neighborhood is. You can also check any public stairs in the neighborhood. 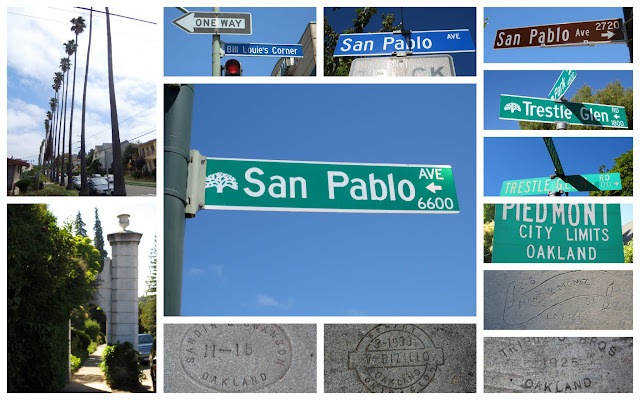 Andrew has a whole blog devoted to Oakland sidewalk stamps. Ruby also pointed out the sidewalk stamps as a way to gauge the age of a neighborhood. Though in the case of the stamps near Piedmont Avenue School, the (original) school was much older (100+ years) than the "WPA 1941" stamps in the sidewalk in front. This technique you may have heard about from Oakland historian Dennis Evanosky on an Oakland Heritage Alliance walk, talking about "the palm tree method." It's probably the least precise but most interesting technique. Basically, if you see one or more old palm trees, particularly a row of them, you can guess that something of historical note was there. Not every palm tree indicates something interesting, but it's a clue that there may be more to investigate. 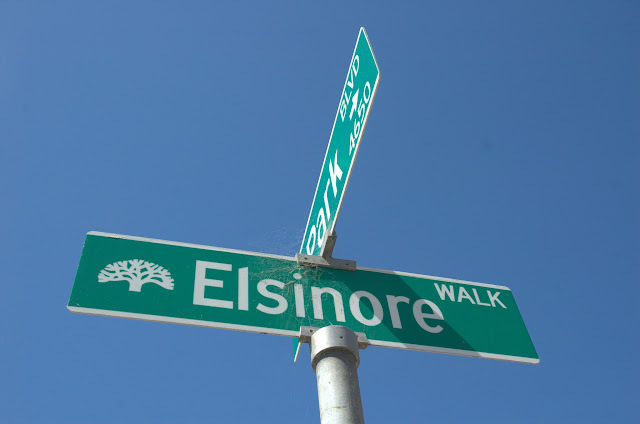 So next time you're walking around Oakland, look up, look down, and look around to see what you can learn about the area you're in. Note: Andrew has good additional ideas he left in the comments: noting where street addresses suddenly change, parking restrictions change, and where recycling bins change. All are clues that you may have crossed a border into another city. The other week was the 2nd annual Ella Baker Center Throw Down for the Town. 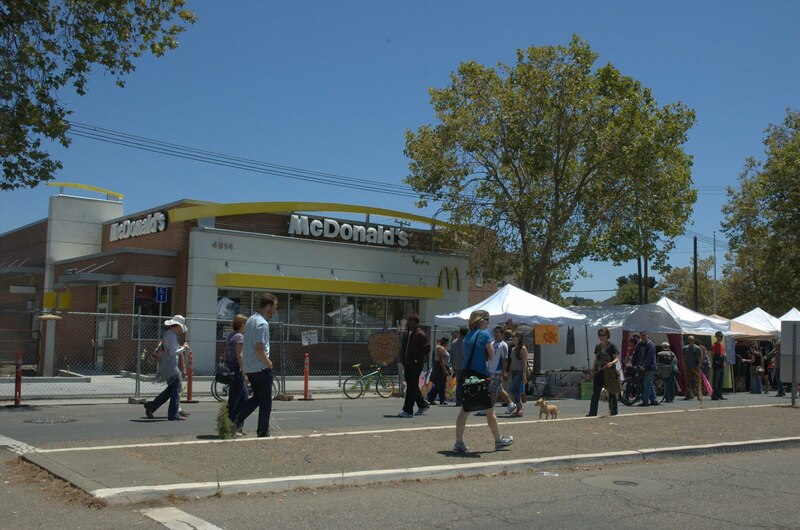 Hundreds of people got together around Oakland to work on different projects to make Oakland better. I volunteered helping clean up a bus stop near 14th Avenue and East 15th Street, a project that was organized by neighborhood resident Francisco. Even with a shortage of tools, we made quick work of pulling weeds, picking up trash, and otherwise preparing the area for a garden. My main task was stomping down the contents of Francisco's green bin so we could fit more in it. Very different than my experience last year with Save the Bay, but still hella fun. I wasn't able to go to the celebration afterwards in Snow Park, but it sounds like people had a lot of fun. Thank you to everyone who came out for Throw Down for the Town, and to everyone who works to make Oakland better every day. Check out the photo album on Facebook for more pictures, and coverage by Oakland North. 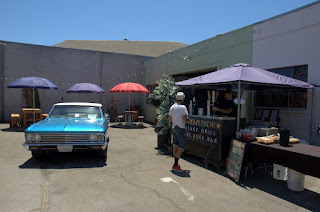 Wondering what to do in Oakland? This weekend there are two big events: Friday is a First Friday, and so the ever-growing Art Murmur and associated events are happening all over; Saturday and Sunday is the annual Art & Soul Festival. 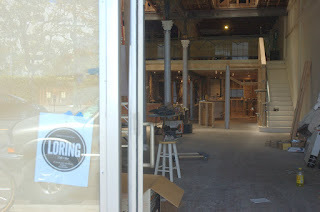 But there's lots of other fun stuff to do if those aren't your thing, with regular events like Bites off Broadway to special events like a ghost investigation! Itook this yesterday while getting ready to test-walk an Oakland Urban Paths walk. I keep hoping to see it lit up because it's hard to take a picture of it with the protective plexiglass. It's on 14th Avenue near Foothill.